My trip to Denver didn’t really include any food places that would knock your socks off, but there are a few dishes and some breweries (there are A LOT of breweries in Denver) that are worth checking out if you happen to be in that particular area. However, I wouldn’t go out of your way to find any of these places if aren’t already close by. One of the appetizers at this bar pretty much made the night. The Ahi Tuna Taco appetizer is phenomenal. 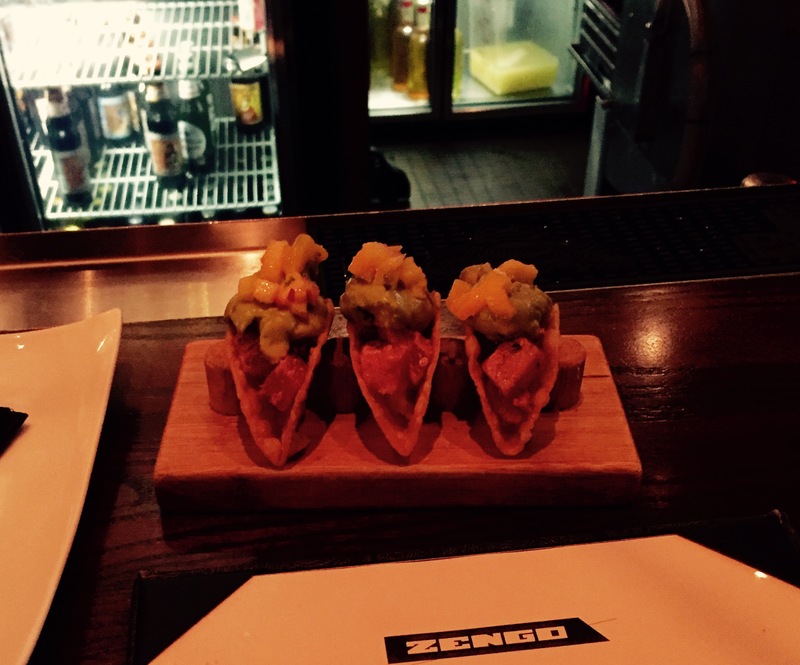 Because the bar is attached to the Zenga restaurant next door, the taco shell they use is made out of wonton. The crunch from that, along with the guacamole, mango, sticky rice, and fresh tuna make this the single favorite dish I had in Denver. Admittedly, it’s a little pricey ($13.50 for three pretty small tacos), but it’s something I had no problem getting over because the dish was that good. This retro diner had one of the most eclectic crowds I’ve ever seen in a restaurant. Sitting at tables around us were, and this isn’t an exaggeration, a fancy Great Gatsby dressed baby shower (I think? ), three Amish looking people, two African American guys dressed like they were extras in Straight Outta Compton, Grandpa and Grandma Joe, and, of course, a slew of plaid wearing hipsters. Wearing just t-shirts and jeans, I’d say we were the “normal” looking group, but I’d suffice to say that each one of those tables also thought that about themselves. Along with the diverse crowd was a fun, neighborhoody vibe. The music was loud, the food was good, but their beer selection needs work (there are no draft beers). Their cocktail list however was extensive. There’s an outdoor patio for the warmer days in Denver and our waitress was super efficient. If I was going to suggest one thing to get on the menu, it’d be the gravy fries appetizer. It’s essentially their version of poutine. It’s not as good as Duckfat’s, but it’s right up there. In keeping with my recent tradition of going to local breweries, Denver Beer Company wins the prize for the most dog friendly of the breweries I’ve seen. Beyond being able to play with other customers’ puppies (which truly is awesome), Denver Beer Company is a pretty run-of-the-mill brewery. The place has the same feel as Allagash in Portland, ME and their beers, although very good, aren’t anything spectacular. This Mexican place looks like a group of BMX bikers and skateboarders got a hold of a Chipotle and made it their own. Imagine a Chipotle, but with skateboarder stickers all over the place, tattooed employees, and a bar with 20 local beers on tap. The setup is the same as Chipotle where you make your own burrito, but they do offer fish, and before they roll up your burrito they mix up all the ingredients in a bowl (so that you don’t get that annoying bite of only rice). Outside there are picnic tables and a giant bocce court. It’s open late night as well, so you can get your Mexican fix at 2 AM after a night of drinking. My co-workers and I discovered this place because it was the answer to one of the team building scavenger hunts we had earlier that day. Apparently it is Denver’s first craft brewery. Located downtown, the brewery itself is actually pretty large; there’s a giant pool hall on the second floor which they say is Denver’s biggest. We only were able to pop in for a drink and a quick pic with the Wynkoop gorilla (which sadly is on my co-worker’s phone), but the best beer of the trip goes to Wynkoop’s Cowtown Milk Stout — definitely worth a try if you like darker beers. Unbeknownst to me before I got there, Panzano is actually the restaurant for the Hotel Monaco Denver downtown. Since my company’s meeting was in that hotel, we had an informal dinner there the night we flew in. I wasn’t really expecting that much thinking it was just the hotel restaurant and I was pleasantly surprised at how good my dish was. The Ragu di Agnello (House made mafaldine pasta, lamb ragú, demi-glace, and Pecorino tartufo) was delicious. Having just been in Italy a few months ago, this dish comes pretty damn close to what I had over there and I would definitely recommend it. I’ve been to a lot of concerts in my time and I have to say that Red Rocks is arguably one of the best places to see a show. Before going, I had heard from several people that it was an amazing place, so the hype level was already high going into it. For those of you that don’t want to drive to get there, a $35 train that leaves from Union Station in downtown Denver is available. When you arrive, the first thing you should be prepared for is a bit of a steep hike up to the amphitheatre. Give yourself a little time to do that, especially if you decide to tailgate beforehand. Since I still wasn’t fully acclimated to the thin air, by the time I made it to the top I was wheezing like an old man. You’re allowed to bring in food, but no drinks (including water). And obviously weed isn’t allowed, but I’m more than certain that most people brought that in. One other tip: Make sure to pack in layers. This actually applies to everywhere in the Denver area. I haven’t been to a city where the temperature varies as much as it does from minute to minute as it does in Denver. It could be 75 degrees and pleasant one minute and then a cloud covers the sun and it becomes bone chillingly cold the next. Most of the amphitheatre seating is general admission so if you really care about the band you’re seeing you should show up early. That being said, there’s not really a bad seat in the house. The incline of the seats is steep enough and there’s a ton of room between your feet and the seat in front of you. You can easily stretch your legs forward and not even come close to hitting the head of the person in front of you. This not only gives you an unobstructed view of the stage, but it also gives you a lot of room to dance and allows beer sellers easy access to get through (they serve beer pretty late into the night, 10:30 seemed like the cutoff time). But the real star of the amphitheatre is the sound. The sound goes right through you. It’s incredible. We went to see the Thievery Corporation and they were great to watch there. Even if you’re not familiar with them, you probably know their song Lebanese Blonde from the Garden State soundtrack. Because they have such an eclectic sound, it’s hard to describe how your body gets so enveloped in the music. As the sun goes down and the stars come out, the rocks that make up the ampitheatre illuminate and it really feels like you’re in a time machine that’s stuck between today and the ancient Roman times. If you’re in Denver and a fan of music, my recommendation is to try and plan a night out at Red Rocks regardless of who is playing. The venue also shows movies and offers yoga as well, but getting there for music should be the top option.